He’s been around for a decade. The stall’s address is #01-17, but the stall name is ‘No. 18’ because that was the unit number before Zion Road Riverside underwent renovations. The numbers moved down by one because of the pathway in the middle. Do you cook individual portions or in batches? I usually cook in batches of 20 portions because that is how big my wok is, but for regulars, I’d cook the plates individually. 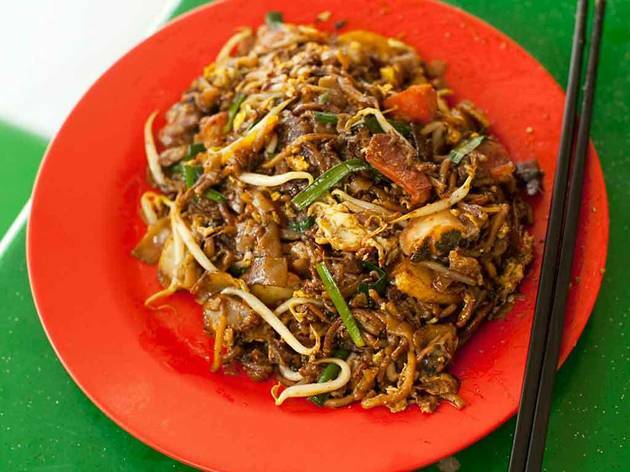 Your char kway teow is chock-full of ingredients, but it seems to be missing prawns. 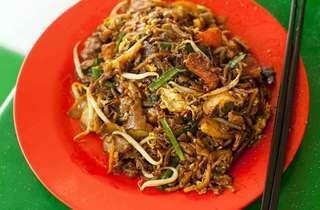 The traditional char kway teow actually has no prawns. I see, and it should be cooked with lard, right? Yes, it’s a must for the dish to taste good. I use a good 300 to 400g of lard a day. Is there a special technique you use to fry your noodles? No. I simply fry until it gets to a certain colour. Its surface must get shiny and reflective. What about the black sauce? Can you divulge what you use? I use ordinary black sauce. As for how much, I can’t tell exactly – I know simply from looking.